New split-knob tread pattern adapted from successful Comp S Light MTB tire, designed for better grip and increased efficiency. Silicium tread compound rolls fast, sheds mud and grips well. Front or Rear use. Folding, Black, Size 700x30, 72 PSI Max, Weight 340g. 27 of 30 customers found this review helpful. The go-to for cyclecross clinchers. This is the go to tire for cycle cross, whether your a seasoned veteran or just giving cross a try. Its fast when its dry but knobby enough for the mud, this tire really does it all. Ask any of the guys that work here what they ride when their not on the tubulars, and they'll answer, Mud 2. A Great Tire for General Trail Riding! Over the Thanksgiving holidays I completed a 120 mile ride with three other riders on the C&O Canal Towpath Trail. While the trail is relatively flat, it has some areas that were pretty muddy and slick especially following the heavy rains they had experienced during that ride time. I was concerned about the narrow width of the tire and whether the shallow tread depth was going to give me problems when riding this trail with my three adult sons that attack trails with a take no survivors attitude on biking. They were all riding knobby tread mountain bikes but even with the compromised trail conditions in a few areas I lost no ground to those young whipper-snappers. In fact when we got to hard ground I felt my tread gave me a decided advantage.While I'm not a competitive rider in my typical day, I certainly couldn't yield to my sons and these tires made it possible for me to stand my ground. I can't comment on their effectiveness in true racing conditions but for me they were a definite win. 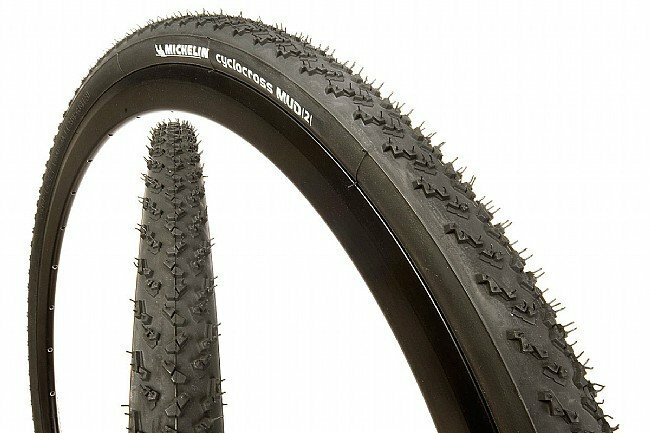 I race cyclocross using these tires on clincher rims. I absolutely love them. I use them in all conditions just changing the tire pressure. They hook up great and don't pack up with mud. These tires worked great in the mud at PIR!! Overall a great tire to race cross in Oregon with!! 12 of 15 customers found this review helpful. I'm using this tire on a Surly Cross-check and the performance has been great. The recommended inflation ratings is a bit high if you're going to be racing cross on them, especially if the ground is really soft. My last cross race only had one deep mud section but these tires bit well and with steady spin got me through it no problem. I've even been doing some pure road work with them and have been able to pull a 17mph average speed over 35 miles (for reference, with Conti 4 Seasons on my Madone I do that same circuit at about 18.8 mph). One last note if you do buy these they are directional! Front tire goes one way, rear the other. Don't mount them and THEN figure that out. Race cross on these with latex tubes. Handles as well as when I used to run tubulars and can handle pressures almost as low as tubulars. Even though they are named Mud they work great in dry loose conditions as well.